Punch-and-bind is a classic way to turn plain pages into a beautifully bound book. It is used to make by businesses to make presentations and proposals for clients, manuals, guides, and instructions for internal use, and journals or notebooks for high volume print shops. Punching/binding can be done with several different kinds of bindings or spines, some of the most popular including wire-o twin loops, spiral binding plastic coils, gbc plastic comb binders. They create professional and convenient documents that allow for easy page turning, and for many, the simple ability to be able to make documents of any kind on-demand and as-needed. But for those that use it, you also know that punch-and-bind solutions can be time-consuming, more labor-intensive than you would like, and sometimes a bit tedious. So if you're feeling exhausted with punch-and-bind, let us help! There are professional document binding options out there that eliminate all of the frustrations you may be experiencing with punching and binding books yourself. We've separated these options out below based on your office size and volume. So take a look and, if you have questions along the way, please call one of our experts at (866)537-2244 (866)537-2244 or email info@buy101.com. 1. Accel Flex (Thermal Binding) - Thermal binding with Coverbind machines drastically increases the speed of bind, while eliminating any previous hassle with punching alignment, time, mis-punches, etc. 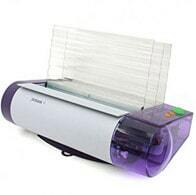 The Accel Flex is a small to medium size office level machine that actually produces bound books as quickly as 15 per minute. If you currently use wire, comb, or coil, you know that it usually takes longer than that to make even just 1 book. Incredibly easy, you just choose the cover you want to use (there are soft covers and hard covers available - bonus! ), put your pages in, and then place the cover into the Flex. It heats up the pre-applied glue in the cover and pulls your pages into the glue to bind them. It will tone in 1 minute when done, and then just move the books to the cooling rack for another minute. Done! Simple as pie so you can get back to work faster. 2. UniBinder 120 (Thermal / Steel Binding) - The UniBinder 120 from Unibind is a form of thermal binding that uses a steel-spine instead of fabric. There is still glue, however, it is the metal in the spine coming into contact with the heat plate that activates it. It works the same way after that; the glue heats up and binds the pages into the cover, and then the cover is moved to the cooling rack to finish bonding. The binding cycle is a bit longer at 2 minutes, then the additional time cooling. You will also notice a handle, which is used for crimping to finish the bind and make it more secure. The added step doesn't add much to the labor/time, so many customer's find this machine the perfect fit for their lower volume needs. 2 books per minute, though slower than the Flex above, is still much faster than the older punch-and-bind alternatives. Sheet Size 5.5" x 8.5" to 8.5" x 14" 8.5" x 11"
1. 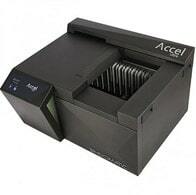 Accel Cube (Thermal Binding) - The Accel Cube from Coverbind uses the same great cover selection as the Flex above, but is a more automated machine. 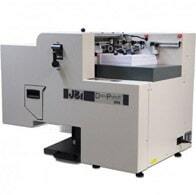 It had Drop&Go technology and is the first machine in the industry to offer automated thermal binding. 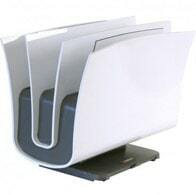 Just like the other machines, you just place your pages into the cover of your choice. Then drop the cover into the machine, and watch as it rotates the machine through the binding process, heating and cooling it, and ejecting it unto an exit bucket. This rotation of the binding process means that you can continuously load books, which creates an astounding speed capability of as many as 60 books per minute. In fact, it averages at 45x faster than punch and bind alternatives. 2. UniBinder 8.2 (Thermal / Steel Binding) - The Unibind 8.2 thermal steel binder is just like it's little brother, the 120 above, but it has a larger heat plate and a more modern design. The larger heating plate lets you bind more books at once. It works the same way; place your pages into the cover, place the cover on the heat plate, and, once done heating, move it to the cooling rack. Then move it to the crimping station; the crimp is automatic when you place your cover into the slot. The 8.2 larger binding tray lets you bid up to 4 documents per minute, and still requires the manual processes of moving it through each step, but it still much less time consuming than punch and bind. 3. Model 9 (Tape Binding) - The Model 9 is a Fastback tape binding machine, also called strip binding. It applies a fabric strip along your binding edge, but is not a full wrap-around cover. Fold the binding strip in half at the crease, and place it into the machine. Place your pages (including covers) on top, tap the edges, and press the bind button. Once it is done, move the book to the cooling station for at least 3 minutes so it can finish curing. It binds just 1 document at a time, however, has a simple and quick binding process that is still about 3x faster than traditional punch and bind options. And the machine durability is meant to handle medium-office workloads, so can run for a large portion of the day without needing to rest. Sheet Size 8.5" x 11" 8.5" x 11" 8.5" x 5.5" to 8.5" x 11"
1. Accel Ultra / Ultra Plus (Thermal Binding) - The Accel Ultra and Ultra Plus from Coverbind are the best of the best when it comes to speed, efficiency, ease-of-use, and versatility. These semi-automated machines have continuous loading with a larger binding station that lets you create books (both hard and soft covers in many varieties) as quickly as 120 per minute! These are seriously amazing thermal binding systems, and there is nothing else like them on the market. The difference between the Ultra and the Ultra Plus is that the Plus has a wider space between the book separators, which lets you bind thicker books up to 1 ½", whereas the Ultra allows for up to a 5/8" thick spine. 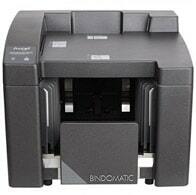 Just as easy as the cube, just place your pages into the cover of your choice, and place the covers into the machine. Press start, and continue the process until your job is done. Your beautifully bound books will exit on the tray for easy removal. 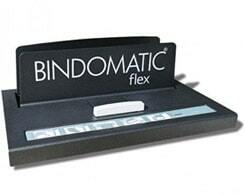 You also get a free stand as well as the Flex model along with your purchase at no additional cost. 2. 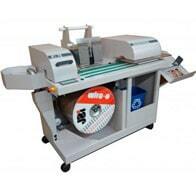 Model 20 (Tape Binding) - The Model 20 is a slightly more automated version of the Model 9. Instead of choosing your strip width manually, folding it, and placing it into the machine you just place your pages into the machine and it will tell you what size tape strip to use (narrow, medium, or wide). Then just put the strip in the tray and press the green bind button. Once done binding, move it to the cooling rack. Though not as fast as the thermal binding alternatives, the Fastback 20 tape binder offers quick 15 second binding cycles and simple solution that is much faster and easier than punch and bind. These industrial-level punching machines are a bit different for a few reasons. For one, they are actually punch machines and, therefore, still accomplish the traditional punch-and-bind finish methods. They are also automated to drastically reduce the speed and labor necessary for other alternatives. These are just a few of our popular options; there are many more industrial binding machines available here as well. 1. DocuPunch Mini - The James Burn DocuPunch MINI brings you the ease and power of the DocuPunch PLUS, but in a desktop unit with a lower price point for smaller shops or those who don't need all the features of the PLUS. Manufactured specifically for the copy center environment and print-on-demand market, the DocuPunch MINI is simple to operate and requires no special training. Simply load the paper, press start, and walk away. The top-of-pile positive sheet pickup helps prevent static, and, when combined with the inner joggers, creates perfect registration and hole placement. It works well with sheet sizes from 8 ½" x 5 ½" up to 11 ⅘" x 11 ⅘", and paper stocks from 20 lb. bond to 110 lb. index. The DocuPunch MINI keeps sheets in perfect pre-collated order, so mixed sheet and tabbed sets are ready to bind without any re-ordering of pages. The control panel has simple icon buttons that are easy to navigate. Changing the dies is completed in seconds, and a variety of DocuPunch MINI dies are available. 2. DocuPunch Plus - The new and improved James Burn DocuPunch PLUS automatic punching machine is the latest generation of the James Burn line of industrial binding machinery. It is as simple to use as a standard photocopier machine, which means that no special training is needed for your operators, making it easy to integrate into more versatile environments and departments. 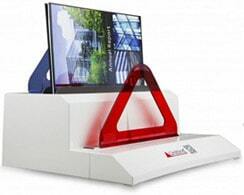 It features hands-free operation with setup that can be completed in under 1 minute using the LCD touch screen controls. 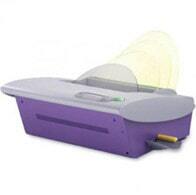 The DocuPunch binding punch machine is an impressive machine that has adjustable speed settings, with the fastest setting making it the fastest machine in its mid-volume automatic punching class. It was designed with the print on-demand market in mind, so your operators can quickly set up the machine, press start, and walk away. Installing and changing the punching die for different binding styles can be done in seconds, and a convenient storage hatch holds up to 3 dies for quick-access. 3. WOB 3500 - Designed to be paired perfectly with a high speed punching machine, such as the Alpha-Doc MK4 or the DocuPunch PLUS, the James Burn Wire-O Bind 3500 (also called the WOB 3500) is a premium semi-automatic Wire-O finishing machine. With the use of one operator to place the punched books onto the machine-cut wire, this industrial wire finisher is perfect for in-plant operations and on-demand print shops. It can be paired with our cost-efficient Wire-O binding spools and works with 3:1 and 2:1 pitch wires up to 1 ¼" in size. 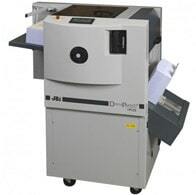 Dependent on your operator's abilities, this machine can have an output of up to about 1,000 books per hour*. It is simple to setup and simple to change wire sizes using the touch screen control panel. The Wire-O Bind 3500 can produce skip binding to make calendars when paired with the optional calendar hanger feeder accessory and calendar hangers. It offers the perfect blend of automatic and manual features to increase production speed without the investment into a fully automatic piece of equipment. Sheet Size 8 ½" x 5 ½" to 11 ⅘" x 11 ⅘" 5 ½" x 5 ½" to 13" x 12" 2 ½" x 3 ¼" to 14" x 14"
* Price and specifications are accurate at the date of this post and may have changed. Click the links in this article for current prices and the most up-to-date information on the individual machines. All specifications, including capacity and speed, are approximations and will vary depending on paper stock, sheet size, book thickness, and other factors.